Think back to when you first started hiking and no matter how long ago this was, the common factor as a newbie, almost without fail, was we usually only hiked in good weather. At worst, at the first sign of rain we more than likely would have called it quits and headed home. At best, we probably found somewhere dry to hole up until the rain ceased. I, like everyone else, avoided rain when I first started hiking and if I’m honest its only been over the past ten years that I’ve stopped being overly concerned about the rain, and I mean real rain here, not just a light sprinkle. Now I’m going to show my love of classic movies here and refer to the movie Camelot, which described a perfect world ‘where the rain wasn’t allowed to fall until after sundown’. Google this song ((https://www.youtube.com/watch?v=8h7E5rtnFH4) if you can be bothered because what it describes is a saccharine sweet existence without variety that is supposedly what everyone wants. But do we? While I want my trips to be mainly sunny and dry, I also like a bit of variation. Sun, rain, fog, day and night all create variation for us as hikers, particularly over longer hikes. The occasional wet weather makes you appreciate the good times and also creates its own magic. Who doesn’t love a rainbow? And if we don’t like rain then there goes Tasmania as a hiking destination! If we take it as a given that at some stage we are going to be hiking in the rain either by choice or by accident, what can we do to ensure we minimise the impact and increase the enjoyment? 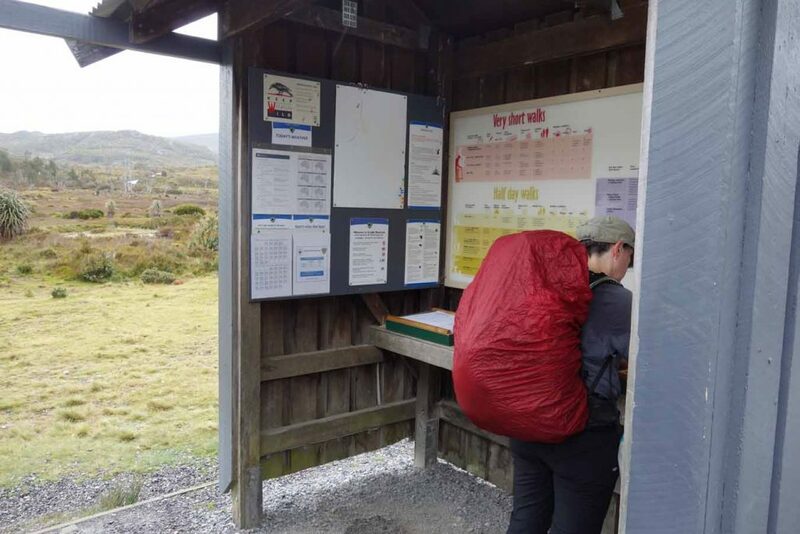 The following are ten ways to improve our experience when hiking in wet weather. This article is also available as podcast at episode 034-10 Tips for Hiking in the Rain. In 2012 we hiked Bhutan and we had a few days of heavy rain out of 14 days but that was the extent of it. 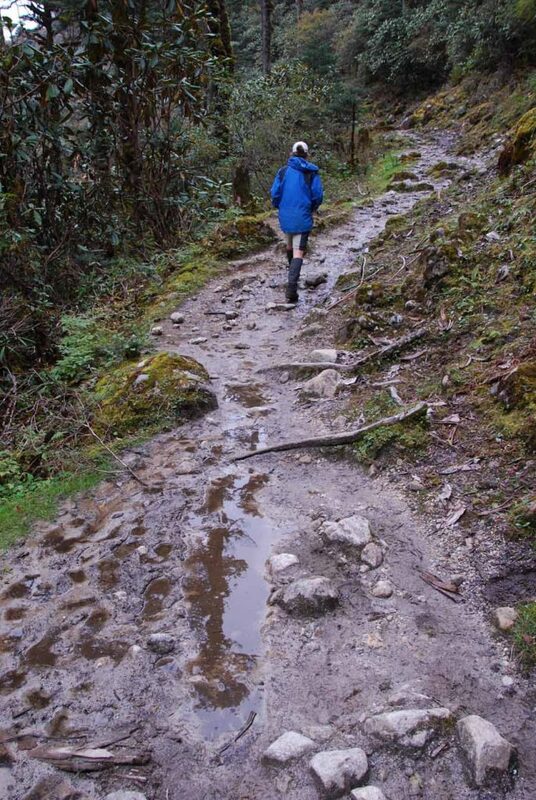 However, the people on the trip run prior to ours had two weeks of torrential rain, cold weather and a solid mud trail. Not my ideal but if that’s what you must deal with you can either complain about it or try to make the best of it by looking for the positives. 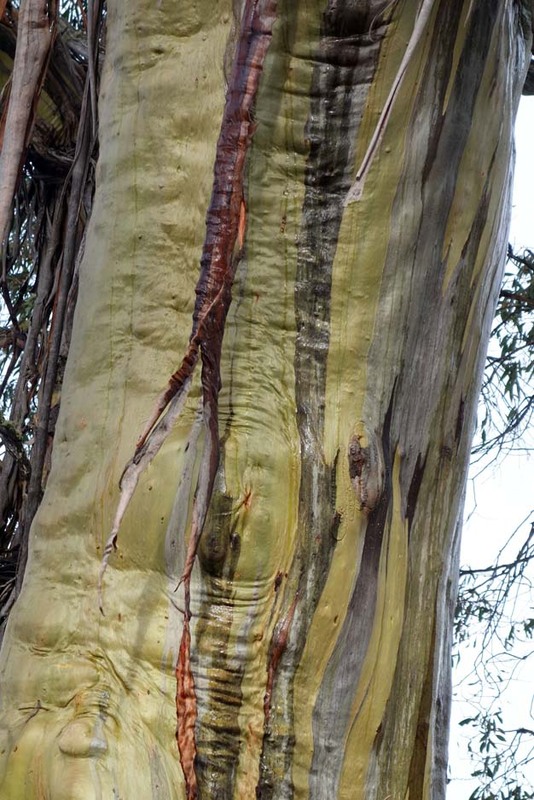 We don’t get rainbows without rain, and the environment smells so much sweeter after it’s rained particularly when walking through conifer or eucalyptus forests. It’s one thing to hike in the rain during the daytime but the last thing you want to do is get into wet clothing and a wet sleeping bag at the end of the day. While I am trying to become an ultralight hiker one of the things I don’t skimp on is waterproofing my pack. All the gear inside my pack is contained within a weather-proof (not waterproof), ultralight Exped zip packs. I have one for clothing, one for technology and one for all the small nick knacks. My food lives in good quality Ziploc bags, one for each day’s food. This collection of small bags is then encased within a waterproof pack liner. If the rain is going to be heavy or long lasting I will also use an external pack cover. Now I don’t use the external pack cover by itself as they are not as reliable as an internal pack liner as a waterproof layer. Most people will say this is overkill but dry warm clothing at the end of the day can be lifesaving, particularly in cold weather where hypothermia can be an issue. It also protects my podcasting equipment from torrential downpours. If you don’t want the expense of a pack liner you can use a good quality garbage bag. The only drawback with this practice is that they have a limited lifespan, which should be fine on shorter trips. Now a word of warning here, it doesn’t matter how good the rain gear is if you are experiencing a sustained torrential downpour then rain gear may not keep you totally dry. When I say good quality I don’t necessarily mean expensive. A good example here is I currently own two pairs of rain pants and my preferred pair is the (much) cheaper of the two. Both pairs are seam sealed but my cheaper pair allows me to put them on without removing my clown-sized footwear. My rain jacket is a different matter and my current ‘go to’ jacket is the Marmot PreCip Jacket rather than the cheaper jacket I will wear when I walk to work. Cheap rain gear is usually, but not always, missing features e.g. armpit zips, or a decent sealing system around the neck to minimise water entry. ‘Pit zips’ allow you to offload excess heat which is going to make you sweat which sort of defeats the purpose of wearing rain gear in the first place. Rain gear should be waterproof, lightweight, and breathable. Heavy Gore-Tex style jackets with ‘storm hoods’ are excellent at keeping you dry but they tend to be heavier and much more expensive. 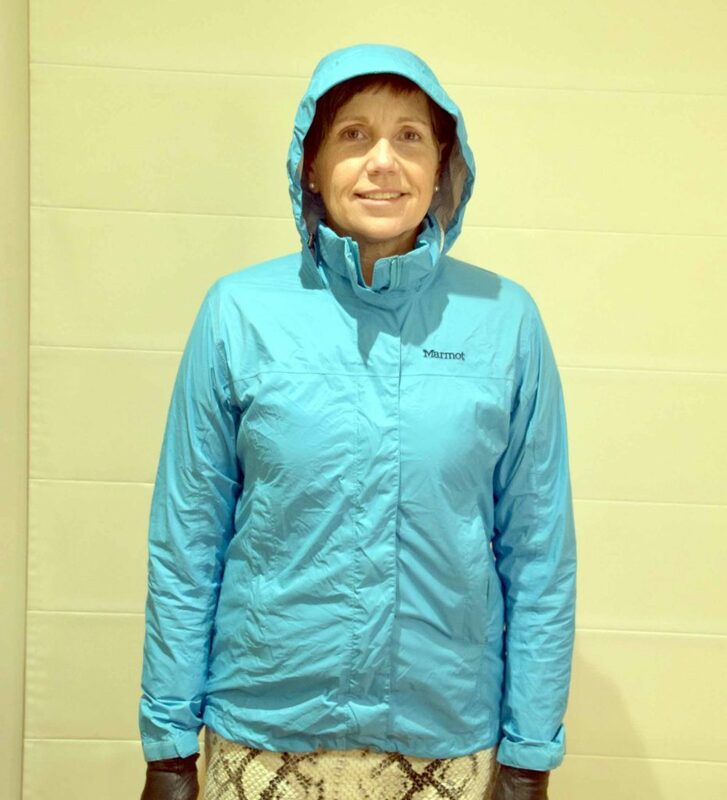 A rain jacket with a stiff peak usually implies a Gore-Tex jacket with a storm hood. While I do own a Gore-Tex jacket my preference runs to a lighter weight jacket combined with a peaked cap. The peaked cap worn underneath the hood of my rain jacket ensures that water doesn’t run straight down my face and inside the jacket and it also keeps the water out of my eyes. A peaked cap can be worn when the sun is out which makes it more versatile. Footwear includes the socks as well as shoes or boots. For extended trips carry three pairs of socks. If you are getting heavy rain, two pairs will not dry out from one day to the next while three pairs will. You may be tempted to put on a dry pair of socks during the day but it’s better to keep the dry pair to wear at night or in bed if it’s cold and if necessary put on the damp socks the next day. When choosing socks go for ones that dry quickly, cause minimum friction and don’t overheat which creates sweat and potentially blisters. Regarding shoes/boots there are two schools of thought here. Boots will certainly keep your feet drier up until the point you need to wade across calf deep water and then they become excellent at holding water. They also take longer to dry out particularly if they are the heavy leather type. Hiking shoes/trail runners get wet very easily but also dry very quickly and breathe. Choice of footwear is one of the biggest arguments amongst hikers and I lean towards trail runners for the majority of my hiking. A good example of this was my December 2016 Mt Bimberi trip that required me to cross a number of creeks that would have filled my boots up but as I had opted for trail runners, I just waded through and waited until the last crossing before changing into dry socks – I didn’t even notice any residual water in the shoes. There are times when I lean towards wearing boots, which is usually when I am concerned about breaking ankles because of unstable trail surfaces. We hiked the Overland Track in Tasmania during summertime and expected regular rain. We did have rain but admittedly less than we thought. We didn’t end up summiting Cradle Mountain which many identify as a highlight. The fog/cloud had rolled in along with light rain and rather than summit a mountain in the rain where we couldn’t see anything, we pushed on. I don’t see any point hiking to a high point on the trail just to say you’ve done it when you won’t see the view! If you have the option, choose a hike that will provide you the best outcomes in rainy conditions. Be aware of any trails where rising creeks and rivers can become an issue (e.g. central Australia). And make sure you read up on the trail beforehand. If there are creeks, fiords, steep slippery sections or if the trail is prone to flooding, save it for a dry day if you can. If you are in the middle of a long hike, plan for how you will deal with these obstacles in a safe manner. Hiking during the rain, particularly if it’s cold can sap you of energy and make you feel miserable. Make sure you have plenty of high calorie food you like and if need be, is edible without cooking. Hot meals at the end of the day are a luxury I normally don’t want to do without but I also don’t want the hassle of cooking in the rain. 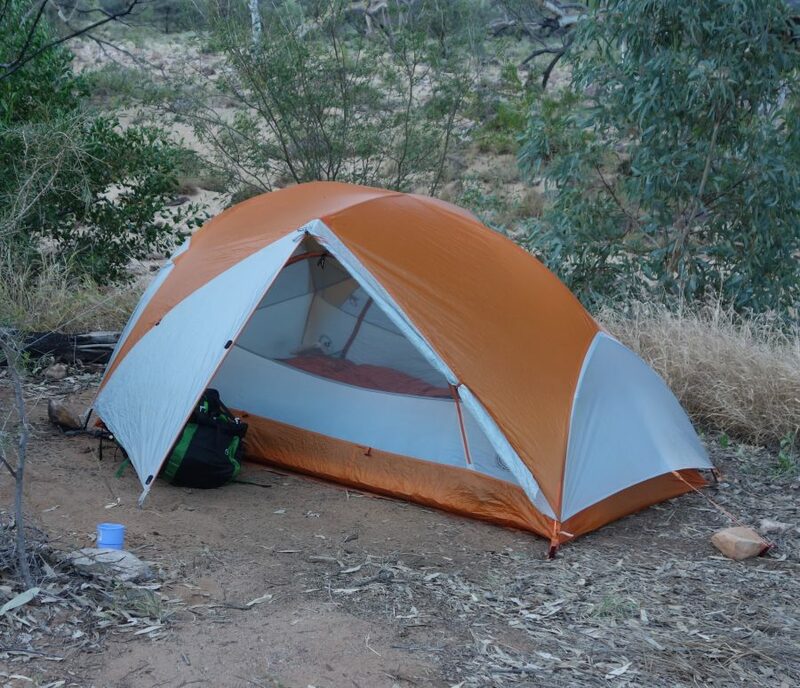 While it may be tempting to cook inside your tent, this is not a recommended practice as tents and fire really don’t mix and not just because you can damage your tent but also because the resulting fumes can be toxic. 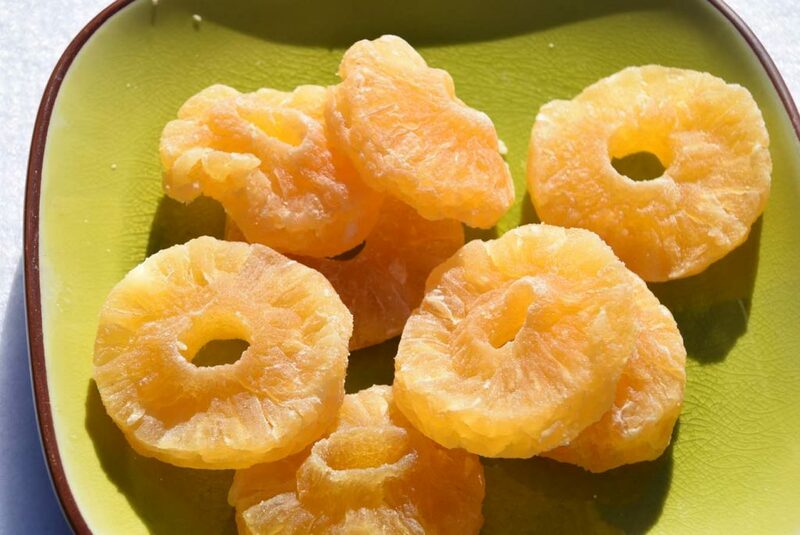 Ensure you eat regularly throughout the day and have snacks that cope well with. When buying a shelter (e.g. tent, tarp, hammock) get yourself one that can be easily set up in the rain without getting soaking wet inside. I’m not a personal fan of tarps due solely to the local creepy crawlies trying to share my bed including ticks and Funnel Web Spiders (although not in the same location). I prefer a lightweight three-season tent (i.e. bug proof) with a waterproof bathtub floor that remains dry in wet weather. You may prefer other options but if you are hiking in wet weather think how your shelter will cope. Practice putting your shelter up so that if it is pouring with rain it can be done as quickly as possible with minimal water entry into the shelter itself. Have you done a shakedown hike lately? Consider waiting to put up your shelter. Is it going to keep raining or does it look like it’s going to stop soon? 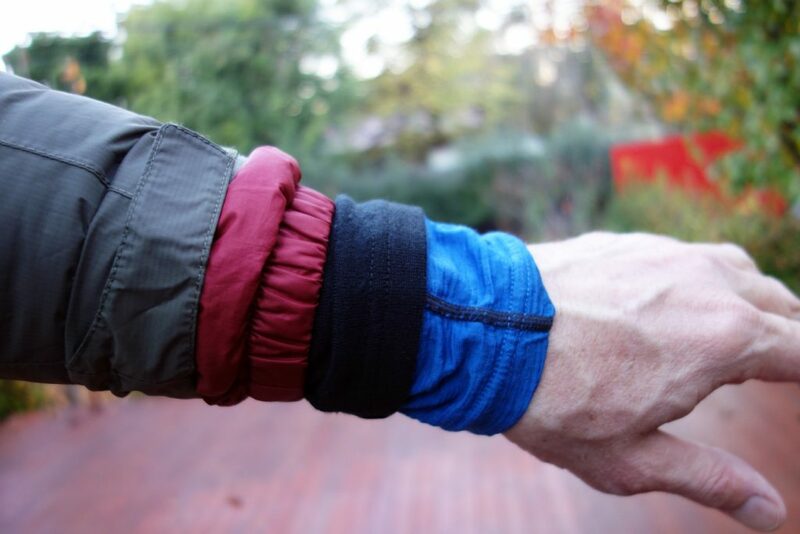 Proper layering is particularly essential when hiking in wet weather. Before you start to do any serious wet weather hiking work out your layering system to ensure you are covered, literally, for any conditions that you may be exposed to. Knowing what you need to wear will minimise the need to remove clothing in rainy conditions. I am usually a fan of wool and down but have a look at European hiking magazines as they tend to lean towards synthetic jackets, which cope better in wet conditions. Just like your shelter on longer trips be prepared to take advantage of and warmth and sun to dry any damp clothing. Keep a layer for wearing to bed at night; you definitely don’t want to sleep in damp or wet clothing. Learning to embrace all types of weather as a hiker will not only improve your skills but will also provide you with a range of different experiences. Sometimes you are out in the middle of nowhere and have no choice but to push on. Having said that, sometimes enough is enough and you may be better off calling it quits if you can and come back to do your trip at a later stage. Don’t persevere just for the sake of it; remember we are supposed to be enjoying ourselves!